Tentmantent: Not really living close enough to this one to keep maintaining it. Time to make a space on the gameboard! The cache is located close to, but not at, the actual church building. This is because there is another cache nearby making it too close to place a container at the church itself. If you can't see the church from the published coordinates, use the additional waypoint. 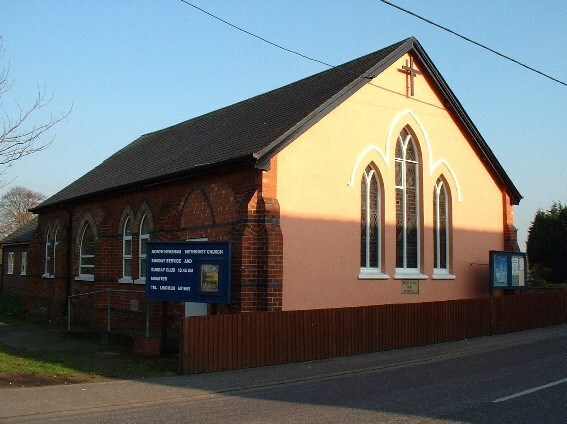 The first Wesleyan Methodist chapel in North Hykeham, then a village, was built in 1838. It was replaced by this building on Chapel Lane which bears a stone plaque engraved WESLEYAN CHAPEL 1881. There is nothing especially remarkable about this church building but it is a good example of how many churches have become good muilti-purpose community buildings, even hosting caching events! The cache location is overlooked by local residences. Please take care not to be muggled or act suspiciously. If questioned, tell them about caching and smile!